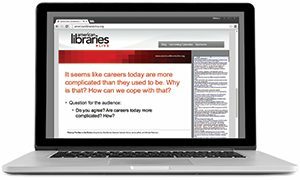 Helping people navigate their way through a new library is an important design consideration. The following libraries use a variety of methods, both subtle and overt, to help patrons know where they are and where they want to go. Finding Your Way: A patterned wood soffit runs the length of the McAllen Public Library building, defining a central service spine for program areas to branch off from. The library is divided into quadrants, with community meeting rooms, the children’s library, adult services, and the staff area each occupying one corner. Most of the building, which was once a Wal-Mart store, is painted white to provide a neutral shell for service areas to be defined with color. Finding Your Way: Brunswick Public Library’s information desk is strategically located in the center of the building, and bookshelves are oriented to enable visibility from the desk to the far corners of the building. 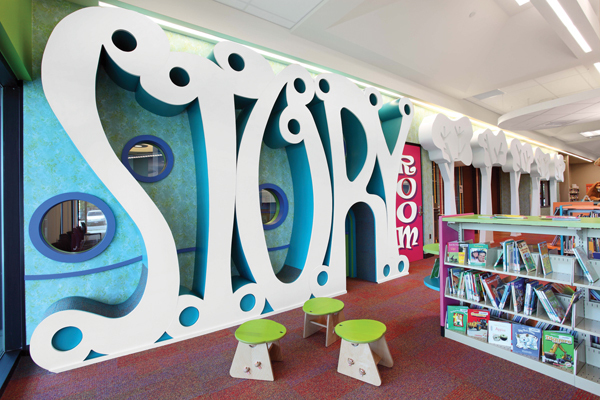 Environmental graphics, unique finishes, and furniture combine to define zones for children, teens, and adults. 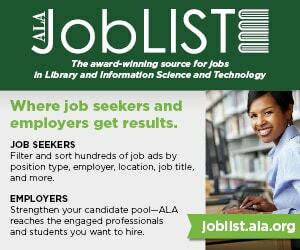 Architect: Morris & Ritchie Associates, Inc.
Finding Your Way: The Murphy-Wilmot Library considered but ultimately rejected going Deweyless after its renovation. The library did incorporate a large “front-of-the-store” display area that makes high-demand new books easy to access. Most areas of the building reduced shelving height from seven to five feet, improving sightlines through the library and offering views of the Santa Catalina Mountains outside. Architect: Sakellar Associates Architects and Planners, Inc.
Finding Your Way: When Palo Alto Library renovated its downtown branch, most staff offices were moved to another facility, freeing space for public services. Key zones, such as the computer area, children’s collection, community room, and staff desk are defined by suspended canopies with bold colors and distinctive shapes. The renovation included new signage to help improve wayfinding. Finding Your Way: Robarts Library is one of Canada’s biggest libraries, and a signature example of the brutalist school of architecture that is among both the most loved and hated buildings in Toronto. A multiyear renovation improved orientation by opening up corridors in the stacks, allowing daylight to extend deeper into the core. Touch-screen terminals in two new porticos identify where study space is available throughout the building. Finding Your Way: The San Marcos Library’s renovation eliminated the circulation desk, releasing 600 square feet to the public and consolidating circulation and reference at one service point. The reconfiguration allowed for the creation of a self-service area with check-out machines, printers, copiers, book drops, and a request pickup area. Patrons enter the library through a marketplace area containing gondolas with the most popular materials for easy access. Finding Your Way: Each of the six floors of the Library and Academic Resources Center is designed for different functions and to provide different levels of technology, social interaction, and learning support. The first floor is an information commons with traditional library spaces, computer labs, IT help desk, cafe, and auditorium. 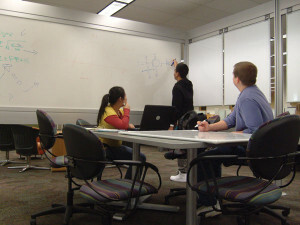 The second floor offers learning support with classrooms, a writing room and tutoring center, and a research help desk, while higher levels focus on individual comfort and study needs. 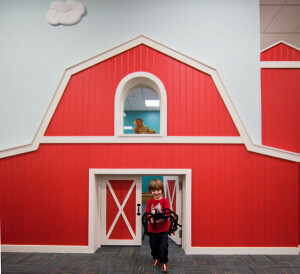 Finding Your Way: Keller Public Library’s renovation and expansion created a new lobby, two study rooms, a technology lab, and this unmissable storytime and craft room, with its own storage area.